Uglyworld #833 - Mini Me's (289-365), originally uploaded by www.bazpics.com. We originally planned to head out exploring today, but waking up to what can only be described as it raining "cats and dogs" outside we had to think quickly to keep the little guys from getting restless. Thankfully Mireille had an ace up her sleeve in the form of some moulding clay which we suggested Wage and Babo could use to make something in front of the TV today. The pair were extremely secretive about what they had made until they were both finished at which point myself and Mireille were summoned back into the living room with out hands over our eyes by an extremely excited Cinko who added, "Waits till you see's what they makes, absolutelies awesomes, I can't believes it myselfs!". After we were allowed to look the pair of us were amazed and shocked to varying degrees to see what they had been making all afternoon. 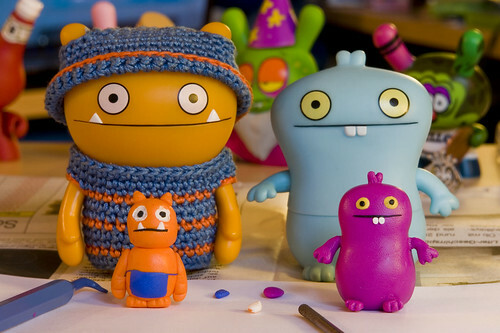 Babo said, "We calls them mini me's, we hopes you likes them!". At present they're trying to hold a moulding masterclass for some of the other guys, so maybe we'll have more miniature sized fun to share with you guys soon too!